REGISTER TODAY and be the 1st to ride the NEW Hampton Roads, Virginia Tour de Cure! Travel through the peaceful peanut countryside of Suffolk, Virginia, past horse farm and scenic lakes for the 2012 event. The Hampton Roads Tour has a little something for everyone – challenge yourself on the Century Ride or dust off your cruiser for the 10-Mile Ride. No matter the distance, you will be fully supported on your route with well-stocked rest stops, motorcycle and mechanical support, and the BEST volunteers. Register today, set a fundraising goal and ask all of your friends, family and co-workers to sponsor you. Better yet, ask them to join your team! The Tour de Cure is not just a ride - it's a challenge. Challenge yourself and sign up today! 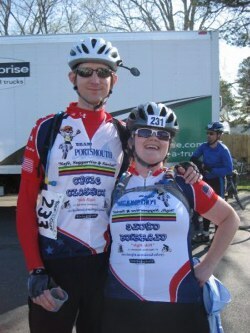 Your fundraising can qualify you to receive great prizes and incentives, including the 2012 Tour de Cure Jersey.